a tumor from the chest of a fully anesthetized male patient. From: Hanaoka Seishu's Surgical Casebook, ca. 1825. Imagine the absolute horror of having major operation, say the removal of a cancerous tumor of the breast, without anesthesia. A state of blissful unconsciousness during surgery is taken for granted now, but the drugs which gave patients the miraculous ability to "sleep" (relatively) safely through invasive procedures have only been in common use for about 150 years. Of A "Blood Tumor" From Her Jaw. 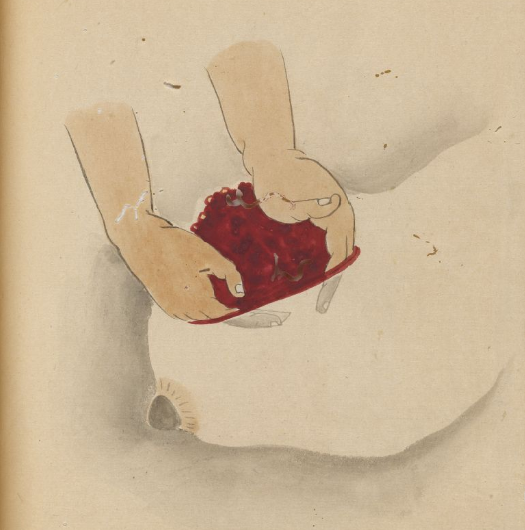 The American National Library of Medicine (NLM) has recently digitized a book recording what is generally believed to be the very first use of general anesthesia during a surgery to remove a cancerous tumor. It is a manuscript containing hand-painted pictures, commissioned by Hanaoka Seishu, a Japanese physician who perfected an herbal formula to induce unconsciousness in 1804. (By contrast, ether was not used as a general anesthetic in the West until 1842.) 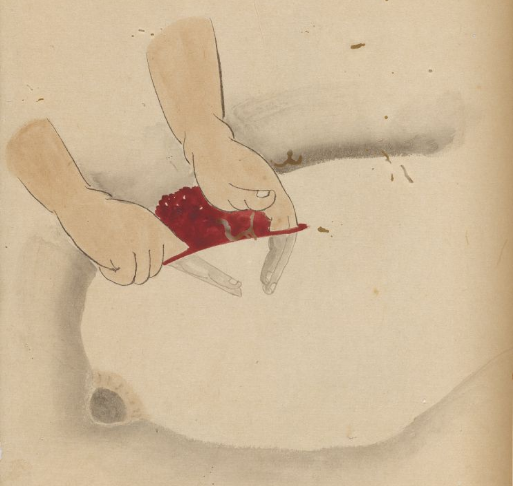 The text is known simply as Hanaoka Seishu's Surgical Casebook (Japan, ca. 1825). Which Appears To Be A Cancer Of The Ear. Hanaoka was born in what was then the completely closed society of Japan in 1760. 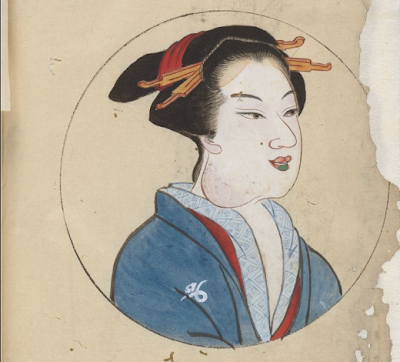 Japanese rulers had expelled nearly all Westerners, and Western books, from their island nation in 1639, fearing the spread of European culture and religion. But Japan's ban on outside influences would not be completely successful. A few Dutch traders in isolated settlements remained, and they insisted on bringing in their own medical men. 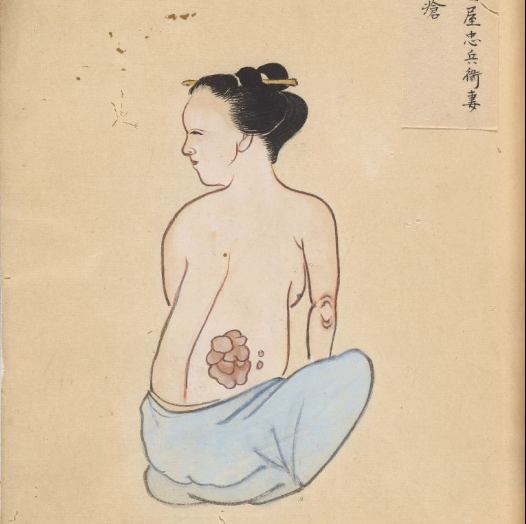 A Merchant's Wife With An External Tumor On Her Back. 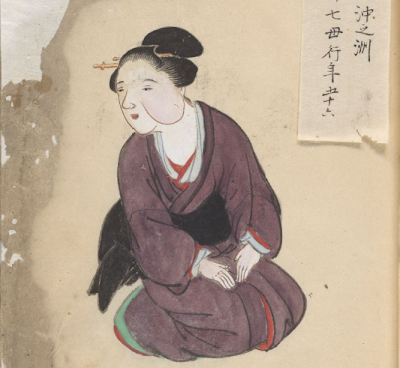 Japan's doctors had always been curious about the medical and surgical practices of the West. (Japanese medicine of the time was based on the Chinese model, in which surgery was banned as "body mutilation," and anatomical dissection of any kind was strictly prohibited.) 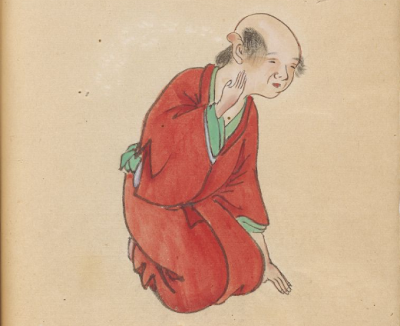 Hanaoka was one of a new breed of Japanese practitioners who managed to be educated in both the herbal medicine of the East, and the "Dutch-style" surgery of the West. Who Appears To Have Cancer Of The Tongue. 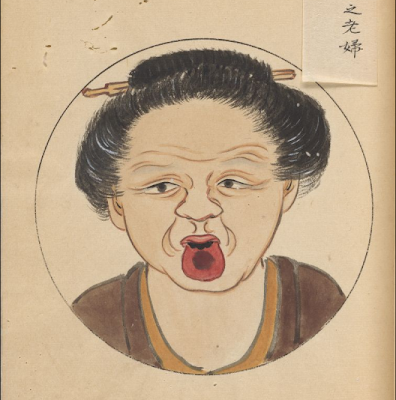 Japanese attitudes towards surgery had changed by the time Hanaoka started his practice in about 1785. Translations of Dutch anatomy books into Japanese had begun to appear, and clandestine dissections of executed criminals confirmed their accuracy in depicting the internal workings of the human body. But in Japan, as in the West, surgical practice remained horrifically painful. Patients had to be physically restrained during operations, as alcohol, cocaine, and even morphine could not completely block the pain of the knife without resulting in a fatal overdose. Seeks Help For A Facial Tumor. 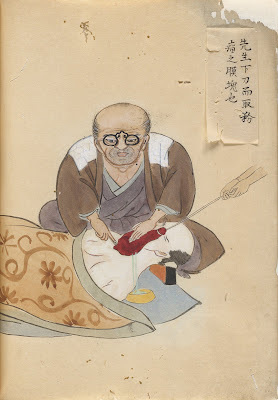 Almost immediately upon finishing his studies, Hanaoka began experimenting with a formula for an herbal anesthesia. 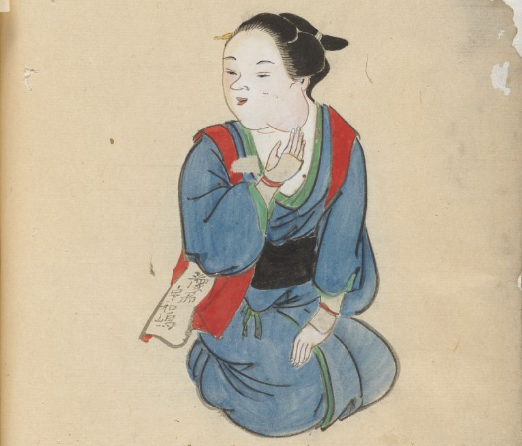 He found no mention of pain killers in his Western medical texts, and his Chinese texts included many concoctions made from poisonous plants which could be topically applied to the skin to numb a small area, but which would prove fatal if swallowed. What he sought was a medicine which could deaden pain in the entire body, and induce unconsciousness, without resulting in the death of his patient. Twenty years of experimentation followed. Hanaoka combined various herbs, at various doses, and proceeded to study their effects on cats and dogs. Repeatedly, the drugs were either too weak to mask the pain, or so strong they caused permanent nerve damage or death. Ultimately, he believed he had a workable formula, but needed a human "guinea pig" to test for the proper dose. To Separate the Tumor From the Surrounding Tissues. Finally on October 13, 1804, Seishu Hanaoka successfully anesthetized 60-year-old Kan Aiya with his herbal formula before removing a cancerous tumor in her breast. She survived the surgery, and noted that she had felt no pain, and had no memory of the procedure. Sadly, she died six months later, as the cancer had been removed too late to prevent its spread to the rest of her body. By Lifting And Removing The Tumor. Hanaoka went on to perform at least a 150 operations of a similar nature, and taught thousands of Japanese students his techniques. The surgical casebook digitized by the NLM is a documentary record of those operations drawn by an unknown but highly skilled artist, possibly with medical training himself. Interestingly, some of the active ingredients of Hanaoka's formula, such as scopolamine, hyoscyamine and atropine, are still used in medicine today. His actual formula, which he called Tsusensan, remained unknown in the West until after the development of synthetic anesthetics, such as ether and chloroform. At that point, his herbal concoction was seen as inferior, and was totally ignored.